Please contact your account representative or call us at 1 (877) 507-3706 for your API key. This endpoint returns the employee(s) details for an account. When none of the optional parameters are passsed it returns all employees in the account. empId No used to filter the result set by employee id. This endpoint returns a collection of employees and their shifts as JSON objects. It has one mandatory parameter and three optional parameters. The apikey is the mandatory parameter, and if it is the only parameter provided, only shifts greater than the current date are included. Only employees who have shifts are included in the result set. The startDate and endDate are optional parameters which serve as bounding dates for the shifts to be returned. 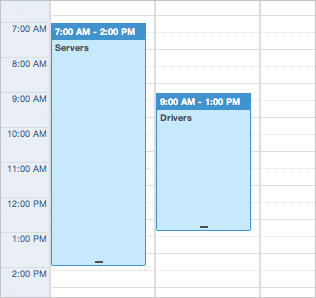 The scheduleName is also an optional parameter used to filter by schedules (locations). endDate No upper bound for the date range of shifts. scheduleName No Name of the Schedule(Location). "formattedEndTime": "Friday, December 06, 2013 2:30 PM"
"formattedEndTime": "Friday, December 06, 2013 7:00 PM"
"formattedEndTime": "Sunday, December 08, 2013 3:00 AM"
This endpoint returns a collection of employees and their time-off requests as JSON objects. It has one mandatory parameter and three optional parameters. The apikey is the mandatory parameter, and if it is the only parameter provided, only time-off requests greater than the current date are included. Only employees who have made time off requests are included in the result set. The startDate and endDate are optional parameters which serve as bounding dates for the time-off requests to be returned. The empId is also an optional parameter used to filter by employee. "notes": "I'm going to a concert"
"notes": "I can't make it this day"